There are two rules that need to be stated right up front, before this post can begin. 1.) Geeks do geeky things. 2.) Geeks with blogs about geekdom do super geeky things. Like, ridiculously, jaw-droppingly geeky things. In my geek career, I have done several things that, in hindsight, I look at and wince a little. Like leaving for a convention before the sun came up, only to sit in an empty parking lot for two hours in the freezing cold, and arguing about why Brian Bendis is better than Dan Slott. Or staring, doe-eyed (and utterly silent), as Neil Gaiman ate a small container of french fries. Or, watching Trekkies II before leaving for work two days ago. You know. Those sorts of things. But today. Today was something different. Something, I daresay, epic. If I were a humble man, I'd say it was nothing, really. Just some driving and some spending of money. Since I'm not a humble man, I'll instead say that today's journey was nothing short of Tolkienesque. And, yes, I stand by my claim that the Great Comic Shop Expedition of '09 that Nathaniel and I set out on early yesterday (and conquered much...um...later yesterday!) is comparable to saving all of Middle Earth, and scouring the known world, ignoring the fact that our little hobbit feet should have never brought us as far as they did. But, fear not, for our hobbit feet never faltered. Okay, maybe we got a little dehydrated at one point. And, fine, maybe at another point I really had to make a stop after drinking two cups of coffee. You really can't underestimate the epic-ness of this day. But I'll let Nathaniel tell the full story. Before me was Alex's elegant new car, shining in the brilliant morning sun. How fitting that the first road trip of this grand geek chariot would be one to a comics shop. Make that two comics shops. The plan was simple: Eat lunch, visit our local comics shop, and then head north to another comics shop. No work, no meetings, no curfews, and only a vague concept of a budget. This wasn't a shopping trip, though; this was a geek excursion, no different from a day at a convention or an amusement park (but with fewer people dressed up in animal costumes, or as lovable Disney characters). Our first stop was a nearby diner, which we ate. ...Where! Where we ate! Sorry about that. Burger, onion rings, and milkshake; omelet, toast, and coffee. This is the kind of stuff Superman has before saving the world, except he can keep the onion rings warm with his heat vision. We felt like heroes. On a journey. A Timeless Journey, you might say. Our LCS was unlike we'd ever seen it before: pleasantly calm, on a Wednesday! The anticipated mid-lunch-break rush consisted of... us, really, and a father looking for the latest issue of Archie Comics, in which Chandler finally proposes to Monica, or something like that. I headed back to the trade paperbacks and Alex perused the latest issues. Somehow between the two of us we picked out an issue of Wednesday Comics my girlfriend was looking for--I had a list of requests from her, and buying back issues in the store is cheaper and easier than getting them online. So I'm told. Our thought here was to buy most of our comics there at our LCS (customer loyalty and whatnot) and to pick up whatever we couldn't find there at our second destination. In terms of spending, Alex won the first round, which means he actually lost because he spent more. Shh! Don't tell him! I don't want to spoil his "victory." I won the second round, though. My plan was to lose miserably, and I actually succeeded, if you consider "losing" to be "winning" here, keeping in mind that winning is really losing. It seemed like a flawless plan at the time: Drive all the way up to Cave Comics, pick up one of the D&D books off the shelf (they're also a gaming store), maybe grab a cheap TPB I didn't see at the other place, and then transform into Alex's tagalong sidekick whose superpower is to ask obnoxious questions about comics he's never heard of. Well, I didn't count on them having D&D Miniatures. 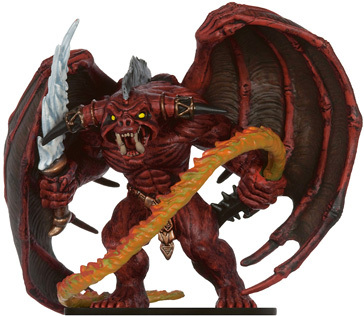 For a good long while I was keeping track of all the latest miniature releases, but I've been slipping ever since my last D&D session several months ago. I completely missed that a new set of minis had been released--a set with not-so-mini minis (which are my favorites) that are visible inside the package. No random guesswork. When I saw those unexpected packages of minis on the shelf, my eyes bugged out and my jaw dropped a little. I began inspecting these magical miniatures. A translucent frost giant. A vicious-looking green dragon. A Borat. I mean, uh, a Balrog. 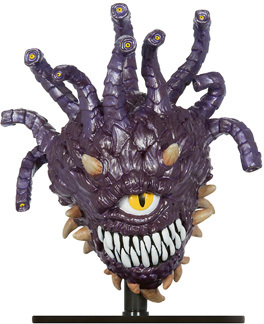 And a gigantic beholder. I may have gasped a little bit when I saw that last one. There was a security camera mounted right above the minis and pointed directly at me, and I'll bet my reaction is priceless. Speaking of prices, I then foolishly went over to the wall of TPBs. And I think I'll end that train of thought right there. Some time later, Alex found me on the floor, surrounded by boxes and boxes of comics. Oh, wait; let me clarify that: I was picking out a comic from the very bottom shelf, and comics shops naturally have boxes and boxes of comics all over the place. Stop confusing the readers, Nathaniel. Judging from the lightness of my pockets, I suspect I left my wallet at the cash register. I still walked out with two discontinued rulebooks for the price of one, so that was more of an unrelated D&D run than a comics run. Rather, we started to go home. But we had no work, no meetings, no curfews, and only a vague concept of a budget; why not hit up the other comics shop in the area, Legends of Superheros? Alex clearly won Round Three, though my purchase of a single booster pack of Magic cards hardly counts as competition. At this point I was really only looking for the items from my girlfriend's comics request list that hadn't yet been obtained--in case you're wondering, you should give up right now if you're trying to locate issue #4 of The New Adventures of Old Krypton, or whatever the book is called, because it just doesn't exist. We searched four different comics shops, but to no avail. Oh, did I say four comics shops? You see, the story should have ended there. "And then we went home." That sort of thing. Except we decided to make a small detour after we left. Perhaps it was the heat, or possibly the pervasive "new car" smell, but we soon decided to find a place to stop for a drink. I was in the mood for an exotic soda of some sort, something gourmet, or at least not a general Coke or Pepsi product; I've seen the likes of Boylan's and Stewart's at a Starbucks and Carvel, so maybe there was one of those nearby? Yes, there was a Carvel not too far away. And it was right around the corner from another comics shop. Aw, what the heck. How often do we get the chance to spontaneously visit four different comics shops in one day? We ended up at a tiny place in Mount Kisco, NY, called Comix Plus. Wow, emigrating from Connecticut for comics. Comix Plus has a minimal comics selection but entire walls filled with collectables from superhero action figures to models of the cars from the James Bond movies. Best of all, there was a glass case filled with trading/playing cards, the most memorable of which were cards inspired by the unforgettable 1996 film The Adventures of Pinocchio, starring Jonathan Taylor Thomas. Folks, I couldn't make this stuff up if I tried. My favorite part was the curio case filled with Star Trek figurines from the early 90s, and I found it impossible to resist the inexpensive Borg figurine, from the era when the Borg wore funny black jumpsuits with parts of appliances glued to their bodies, before they became the really creepy doom cyborgs we all know and love. Alex, however, simply browsed. I won Round Four. Eventually we found a meter that still had time left on it. Alex went to drop in a coin, but I was able to halt him just in time so he didn't do something to trigger another message of "FAIL"--in retrospect, I think our mistake was trying to put money in the meter. New York parking meters apparently encourage you to keep your money because parking must be free. I will remember this the next time I drive into the city. The conclusion to our trip was a refreshing one: we stopped at Carvel for sodas. Not ice cream, though. Amazing. It had been a few hours since our last drink break, which was back at Alex's house after we left A Timeless Journey. A wise, brief, and enjoyable break, just as this one was. We sat outside Carvel for a little while, listening to a woman SPEAKING ON A CELL PHONE AT A LOUDER VOLUME THAN NECESSARY, and reflecting on the day. It wasn't about the comics or the minis or even the onion rings; the whole point of our excursion was to get out of the house, escape from reality for a while, spend some time together as friends, drink up the atmosphere of comics shops, and marvel at the fancy artwork and at THE VOLUME LEVEL OF THAT WOMAN ON THE PHONE. We didn't have to buy stuff to enjoy ourselves, but there's a certain joy about picking out comics and bringing them home, and we're certainly going to use everything we bought. Right now that pile of comics is being used to make my bedroom more flammable, but I will get around to reading them all in good time. Hang on; I just figured out why Alex started off by calling me a hobbit. Frodo and Sam have this quest to destroy the One Ring, right? And they get rid of it by tossing it into a volcano, right? Well, it's not exactly the same, but it turns out my girlfriend got a plastic Black Lantern ring that day. Maybe we were supposed to put the ring in the parking meter!